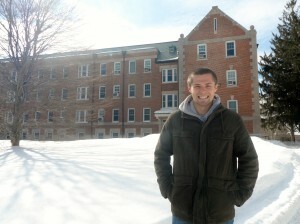 Dustin standing by Koons Hall, home to the Doctor of Physical Therapy program he will attend starting this summer. Let’s face it…filling out an application to get into graduate school feels like high school all over again. Will I get in? What if I don’t get in? Should I fix my essay? Are my grades good enough? After going through the entire application process, I’ve decided to highlight the most important parts of the application. My goal is to help every UConn CAHNR student looking into graduate school to use these ten tips to have a stand-out application. There is also an extended version for anyone interested in a particular topic! I used these tips in my graduate school application and it led to my acceptance into UConn’s Doctor of Physical Therapy (DPT) program. My tips: Research the average GPA for accepted students at the graduate programs you are thinking about applying to in the future. If you are worried about your GPA, put the effort in to improve the rest of your application (including ALL the parts of this Top 10 list). And remember, be confident…you are at UConn because you are smart enough and worked hard to get here! My tips: Find a job that incorporates your future career. Keep up-to-date on your résumé and apply early, especially if you are looking for a job in good ol’ Storrs, CT! Do not wait until two or three weeks into the semester because by then there is a good chance the application pool is full. At the very least, apply to a job the first few days back on campus…but I would recommend you apply weeks before we get back. Employers LOVE to see that you can work during breaks. My tips: Pre-requisite marks are just as important as your overall GPA because they are good indicators of how well you will do in your respective program. Freshman and sophomores, use your resources! The Q Center and Writing Center at Homer Babbidge Library are incredibly helpful. Also, highly consider taking a pre-requisite course at UConn and retake any pre-requisite below a B. Do your research and take a look at the websites of any graduate school that interests you! My tips: Prepare well in advance for your respective standardized test. By your junior year, know what test you will be required to take and save a small amount of cash to buy the prep book. My biggest tip: TAKE THE TEST EARLY. Do not wait until the last minute because this can induce a lot of stress on you to do well only taking the test once. Most tests can be taken multiple times, but you have to wait a few weeks before you are allowed to take the test again. Study hard and set aside time every week to prepare yourself for this very important exam. My tips: Start spending time getting to know a professor you like. Go to office hours and spend time talking with them about their field. Also, for whatever career interests you, look in the community for opportunities to shadow a professional in your respective field. As long as you put the effort in and do not wait until last minute, you should be set to have great recommendation letters! My tips: Get your résumé critiqued at the Center for Career Development. They also provide examples for students to follow. This is an extremely valuable resource for UConn students and you should definitely utilize it. Also, my Top 10 Tips include most of the content you want on your résumé! My tips: Not every school has an interview process, but most do. If you are offered an interview by a graduate school program, this is a great sign! This means you have a competitive application and they want to get to know you. So prepare yourself by visiting the Center for Career Development and taking part in a practice interview. Know your résumé and research common interview questions to get a feel for the types of questions they may ask (such as: What’s your biggest weakness? Why did you choose our graduate program?). My tips: Set apart some time to volunteer around Storrs. There are so many opportunities on campus to join a club focused on volunteering. Be sure to go to the Involvement Fair and find a club that interests you. Volunteer experience can also improve your résumé. My tips: Understand what your prompt is and be creative in how you write your essay. You need to stand-out from the other applications while maintaining an understanding of the goal of your essay. Go to the Writing Center and they can help you write an irresistible essay! My tips: Find a balance between school work and your social life. Set apart time for yourself and for your friends because school work can be overwhelming; you just need to find a balance between class and social life. Make college a positive experience and enjoy every moment of it!